Kelsey Clark was a happy, healthy fourth grader when a bump appeared on her shin one spring day. But a month later the bump was the size of a golf ball and sore. Doctors at Bluewater Health sent the 10-year-old to London for further testing. “We braced her leg and started driving to London for a biopsy, and by the time we got there it was already fracturing,” Brenda Clark said. Doctors discovered Clark had an extremely rare form of bone cancer that accounts for just 0.05% of global cancer cases. Called adamantinoma, it had turned Kelsey’s leg bones porous and spongy and ready to shatter at the slightest pressure, X-rays showed. 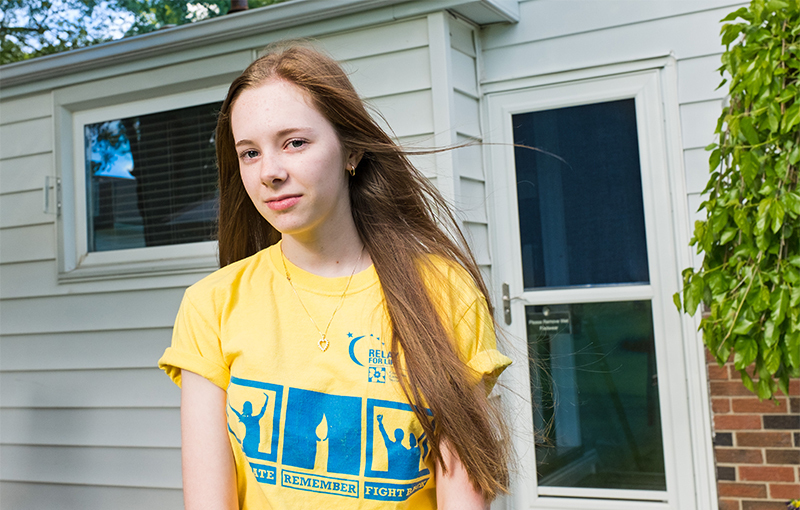 “I understood the concept of it but I wasn’t grasping the situation,” recalls Kelsey, now 15. Her mother, however, knew it was bad. A few months later, on April 24, 2012, Kelsey underwent a 15-hour operation at Sick Kids hospital in Toronto involving five doctors drawn from a variety of disciplines. The only treatment for her cancer was to remove it. Her right shin was completely re-built by transplanting bone from her other leg, along with fabricated metal parts and skin grafts. Kelsey believes she has had nine surgeries so far and may need more as she continues to grow. For three of those years she lived with her mom and brother and sister in Toronto while her father continued to work in Sarnia, visiting on weekends. Transportation, food, lodgings and medication one year totaled about $29,000, Brenda Clark said. Thankfully, the transportation was covered by the Canadian Cancer Society, which also offered ongoing support and made other arrangements to assist, the family says. Kelsey, now a Grade 10 student at St. Patrick’s High School, has been cancer free five years. And she has given back by raising several thousand dollars for the Society through the annual Relay for Life. On June 16, she and hundreds of other local survivors and their supporters will return to Clearwater Arena Park for this year’s Relay. Kelsey’s first was in 2012 when, just weeks out of surgery, she completed laps pushed in a wheelchair. Now at her sixth Relay, she can walk and even run short distances. She wears her cancer scars, she said, like a badge of honour. WHEN: June 16, 6 p.m. to 12 a.m.